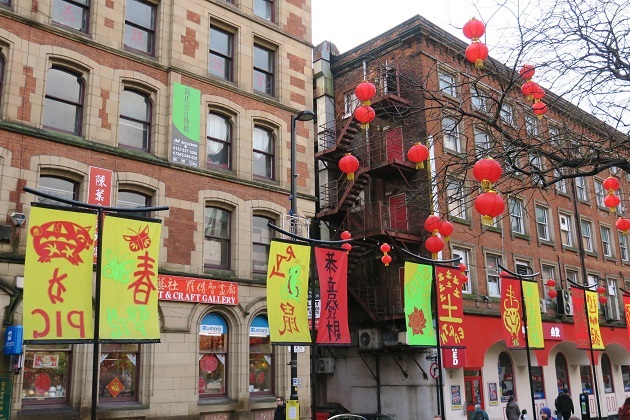 With the second largest Chinatown in the UK, Chinese New Year in Manchester is quite a big deal. 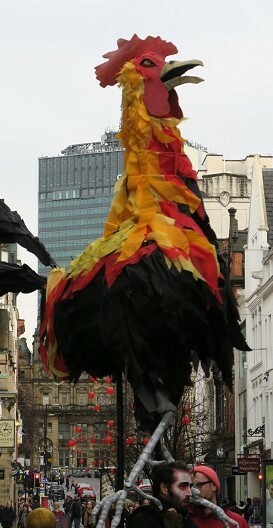 There is always loads going on and this year of the rooster was no exception. Keen not to miss out we headed into the city to check out the celebrations. Past expeditions on Chinese New Year have been fun but very crowded, this time we were pleasantly surprised. It was busy but way more bearable than normal. This might have had more than a bit to do with the weather – pouring rain all day long. Umbrellas at the ready and togged up in warm clothing we set off undeterred by all that wet stuff. 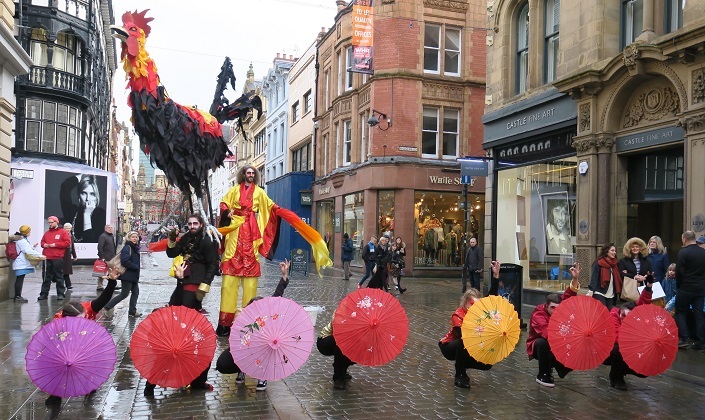 On our walk to Chinatown we stumbled upon the Travelling Light Circus – a roving group of dancers, a couple of drummers, a stilt walker and a gigantic rooster that you just couldn’t miss. They were all dressed up and making a lot of noise. We watched them dance and saw the rooster strut up and down one of the shopping streets. 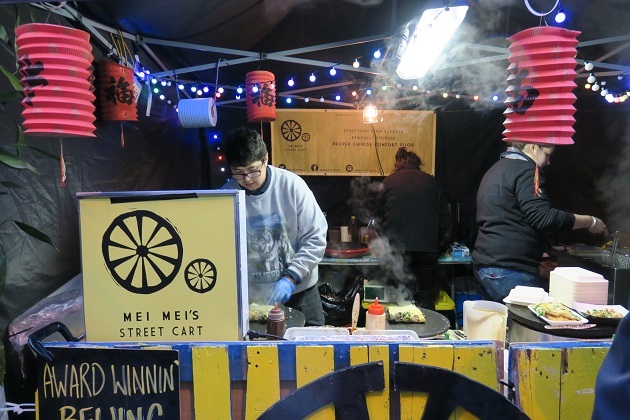 A Chinese street food market was going on in another of the main squares. 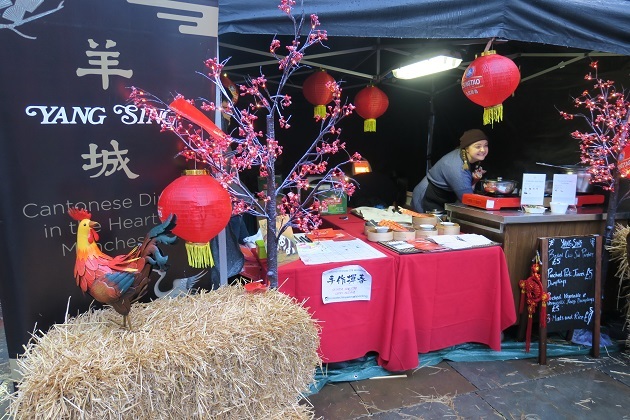 Several stalls including the Yang Sing, perhaps the most famous of the city’s Chinese restaurants had a delicious array of food on offer. We did not succumb to temptation having already eaten lunch – not so easy. 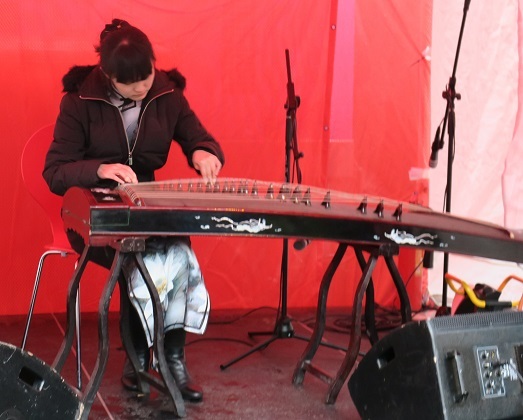 We did linger a while though to listen to a Chinese musician playing an interesting looking instrument on a little stage. We found the lion dance going on in another part of the city. Chinatown was decorated with red lanterns and looked very festive. One of Son’s favourite things to do here is browse in the supermarkets. Not a shopper normally he loves these places packed with obscure items you don’t find in our usual shops – pigs trotters were a hit this time. We didn’t hang around too long, the supermarkets were incredibly busy and I had forgotten just how narrow the aisles were. We had to queue to get out. 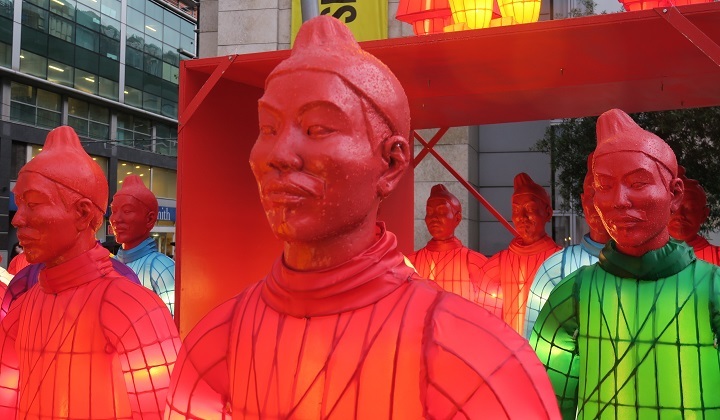 By the time we made our way back to the city centre it was getting dark and we were properly able to appreciate those lovely lanterns – thousands of them along the streets plus some of the buildings and shops were lit with red lighting. Just before the rain finally drove us away we went to see the Lanterns of the Terracotta Warriors. This was originally commissioned for the Beijing Olympics and has since appeared in various cities around the world. 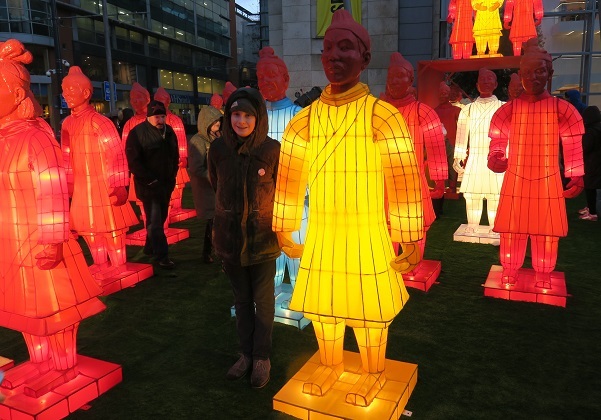 Over Chinese New Year Manchester played host to forty of these seven foot high lantern warriors. 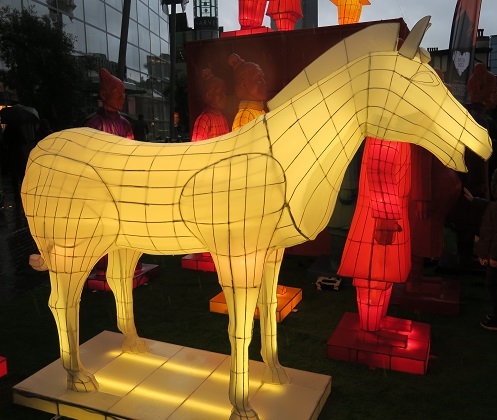 The two huge lantern horses were also impressive. 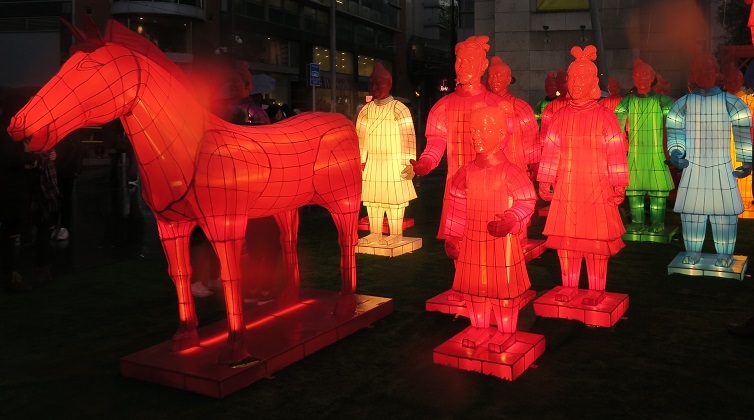 These lantern replicas are modeled on the original clay statues, just nowhere as many as the 8,000 guarding the tomb of the first emperor of China. Son was impressed with them – we all were – and being able to get up close to the warriors and wander amongst them. The models were lit from sunset and looked pretty spectacular in the dark. a great way to end our day. 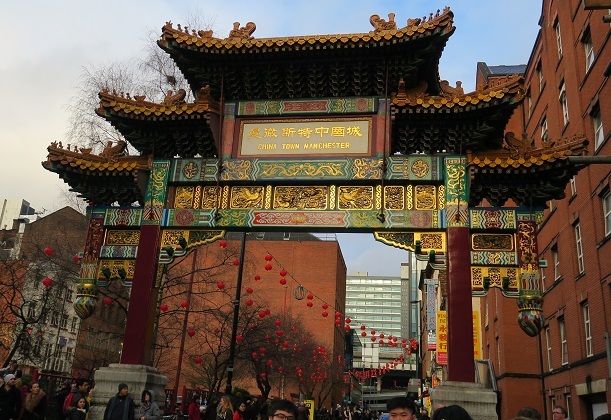 How lovely that you were able to join in the Manchester Chinese New Year Celebrations. 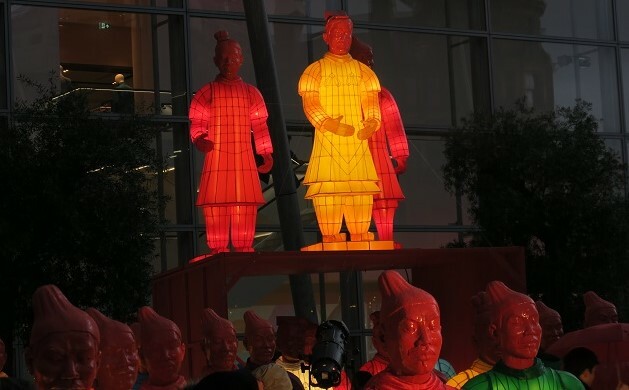 Those lanterns hanging from the trees look beautiful and I especially enjoyed the photos of those Terracotta Warriors on loan to the city. Just a pity about the rain! We had a lovely day out and those lanterns were very impressive. Typical that it rained so much though – reasonable weather all week and a torrential downpour on Saturday. It is Manchester though!! Hope you have a good weekend. The lantern warriors were in Edinburgh for a while, they are beautiful aren’t they. We loved them, so impressive and the fact you can get really close was great. After dark it got even better! It’s a really colourful and vibrant festival – we love it. 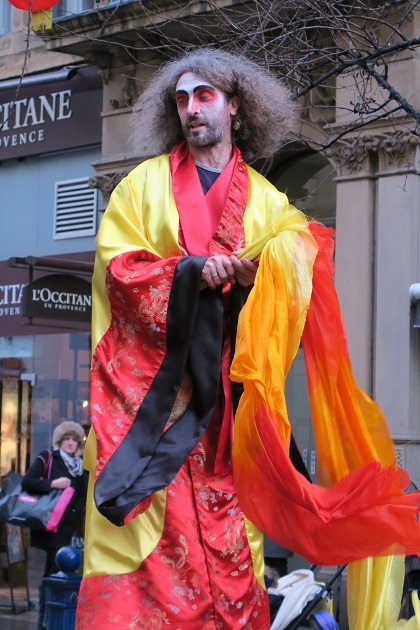 Yes that rooster was something else – seeing him coming down the street was really impressive! Hope your weekend is a great one too Kamila. 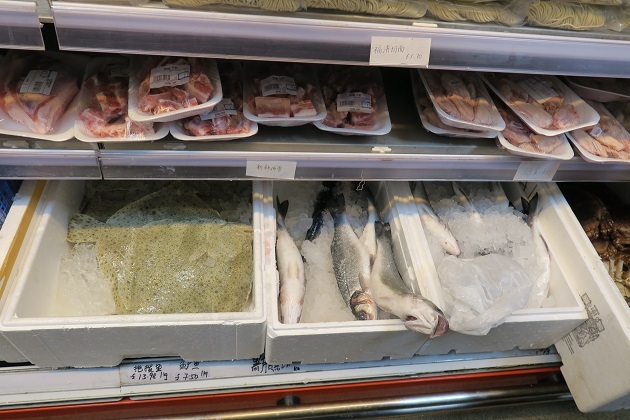 One of our favorite things to do when traveling is to visit the food markets! Always fun to see what appeals to others! Not sure about the pig trotters, but hey each to his own, right?! The lanterns in the trees look so lovely! Food markets in foreign countries are my favourite, we just love wandering, looking and tasting. 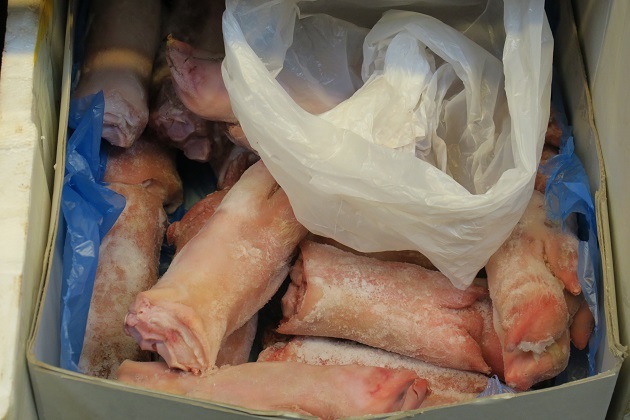 Didn’t try the pigs trotters but yes you are right, each to their own. Who knows, maybe they’re delicious!! The lanterns were a lovely touch and all over the city, they were even more lovely after dark. What a fantastic event. The lanterns are spectacular. It was loads of fun, rain aside we had a great day out. Shame the lanterns couldn’t stay a while longer!! 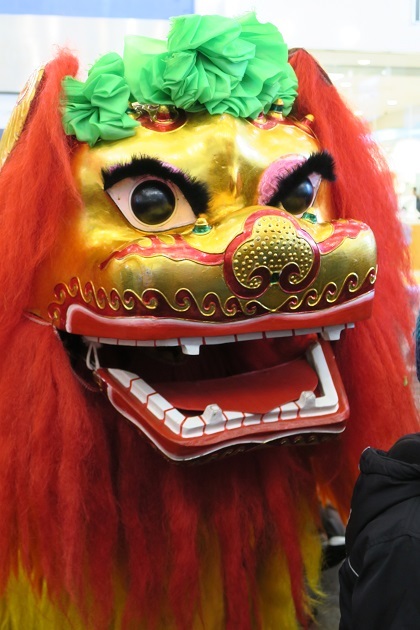 You should try and visit over Chinese New Year – its so much fun! 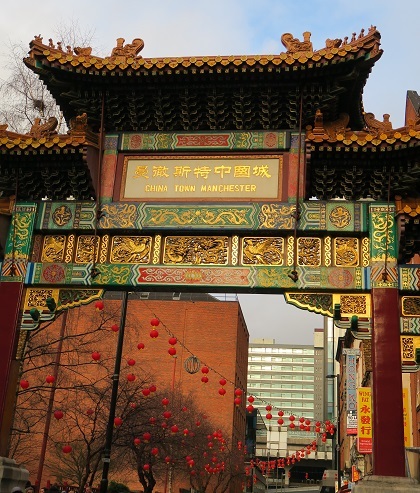 We went to CNY celebration in Manchester last year. Crowds were insane….so bad we didnt stay as long as we hoped. Glad it was more bearable this year…despite the rain! Looked like a great celebration. We didn’t make it last year but have been in the past and had exactly the same crowd experience where we left earlier. This year was completely different, not sure if it was due to the weather or not but despite the rain it was so much more bearable!! What a stunning array of colours Joy! Would have made a wonderful contrast to the rainy weather. 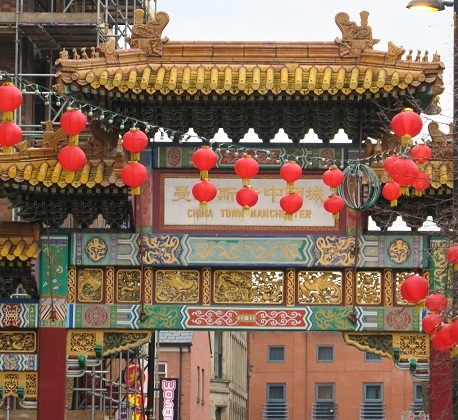 I had no idea that Manchester had such a large China Town. 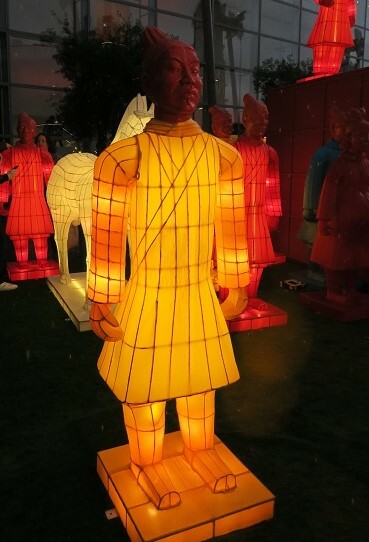 Not so sure about the pig trotters but I love the Terraccotta Warrior Lanterns! Looks a fun family afternoon out and a great way to brighten up a dreary weekend. Hope this weekend is better though I think it’s quite cold over with you at present! We loved the lanterns too Rosemary, despite the rain which poured down even more when we were looking around them. Still it was worth getting soggy! Much better weather this weekend, it is cold but I don’t mind that as long as it comes with bright sunshine and today it does!! Hope you have a lovely weekend too. 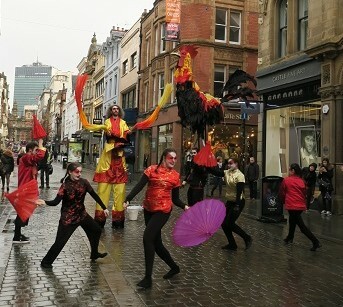 Joy, the Manchester celebration of the Chinese New Year looks festive and fun. It appears you enjoyed in spite of the rain. I noticed Son is going to be taller than you soon! It was such a fun day out Pam. He is already a fraction taller when we stand together – I’m the shortest in the family now!! Gorgeous, I love the warriors – I see from another comment that they’ve been to Edinburgh so I’m sorry to have missed them. They were impressive, I didn’t know much about them until I read they were coming here. Shame you missed them Anabel. I have such a thing for Chinese lanterns and I really should go out to the festivals..I don’t know why we don’t. Seeing your images makes me realize I’m missing out! 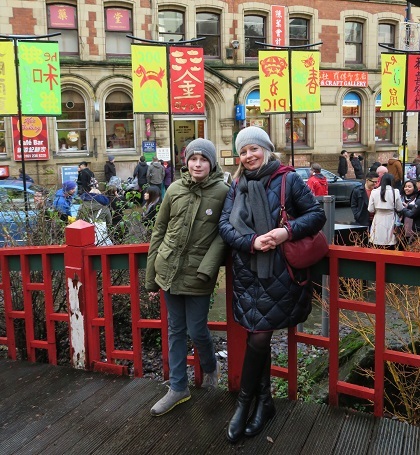 Chinese New Year is loads of fun – definitely recommend!! This year we had the worst weather and still had a great day out! Joy, sounds and looks awesome! We’ve participated a few times in Helsinki too but couldn’t unfortunately make it this year. We didn’t make it last year and almost changed our minds as the weather was so horrible but I’m glad we didn’t!! It was such a great day out. 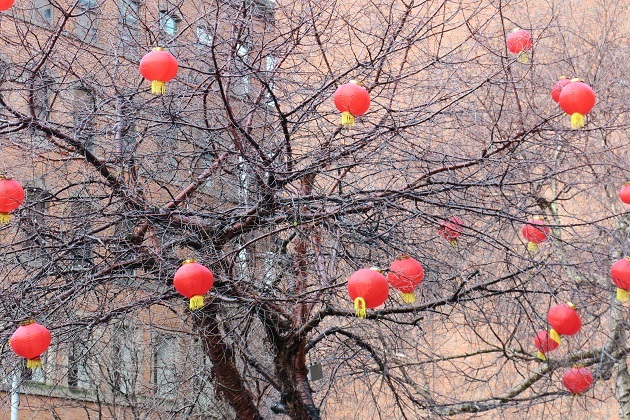 Btw, I especially love your shot of the red lanterns in the frozen tree. The terra-cotta warriors are very impressive! All lit up at night they were spectacular, we were so glad we got to see them Ana. Wow that’s one heck of a celebration! I wish we had that here in Dallas! It’s such a lovely family day out – so colourful and a real spectacle! And the food looked delicious! I LOVE that giant rooster! I really like chickens, so I’m kind of excited about it being the year of the rooster. It means there’ll hopefully be lots of delightful rooster signs and statues around Chinatown to appreciate! That rooster was something else!! Kind of surreal to be walking down the street in Manchester on a dreary and wet afternoon and then see that coming!! Chinatown here had loads of roosters around, hopefully they stay for the year! Absolutely! It was a great day out, we love different festivals and experiencing different cultural traditions – this was superb. 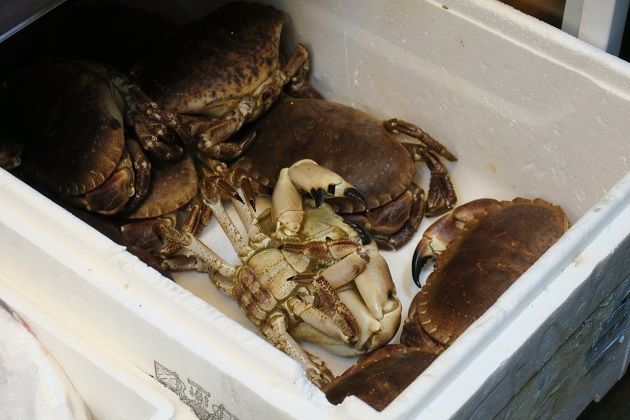 A bit of a shame about the pouring rain when we saw them, that was the only downside!